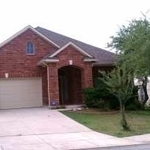 Luxury home for rent near Lackland AFB in San Antonio, TX. 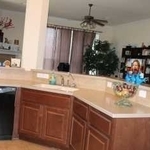 Beautiful, high end red-brick home has plush carpeting, tile, high ceilings, open living room, kitchen w/nook; formal dining room; nice yard with privacy fence. 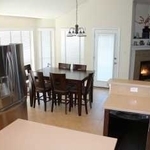 Appliances: built-in oven; stove; microwave; refrigerator; Corian kitchen countertop; kitchen island.Den w/french doors can serve as additional (4th) bedroom. MORE QUALITY FEATURES: water softener; central A/C; gas fireplace with remote control; Access to neighborhood pool and playground. 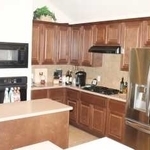 Master Bath w/shower AND Garden Tub; high end kitchen cabinets; raised vegetable garden in back yard; spacious walk-in closet in master bath; washer/dryer connections; roomy kitchen pantry; Back yard deck. Second bath has "Jack 'n Jill" layout accessible to two bedrooms. 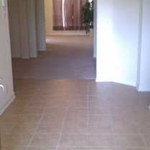 This is a great layout with easy access from hallway. Bar area between kitchen opens to the living/TV room--great for entertainment!